This medieval surname with variant spellings Jacubs, Jakobs, etc. is a patronymic of the given name Jacob, from the Latin Jacobus, itself coming from the Hebrew personal name Yakoov, which is traditionally interpreted as deriving from the Hebrew "akev" meaning "heel". In the Bible, this is the name of the younger twin brother of Esau who took advantage of the latter's hunger and impetuousness to persuade him to part with his birthright "for a mess of potage". Jacob was said to have been born holding on to Esau's heel. The surname dates back to the mid 13th Century (see below). Church Records include Henry Jacobs who married Sarah Harris on May 12th 1684 in the Church of St. Katherine-by-the-Tower, London, and Francis Jacobs who married Frances Lefever on February 9th 1696 in the Church of St. Dunstan's, Stepney. One Kenny Jacobs, aged 50 yrs., a famine emigrant, sailed from London aboard the "Prince-Albert" bound for New York on March 13th 1846. 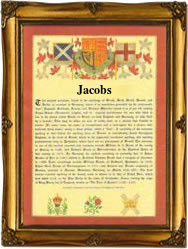 A Coat of Arms granted to a Jacobs family at Ripple in Kent is divided quarterly, dancettee black and gold, and in the first quarter a gold pelican. The first recorded spelling of the family name is shown to be that of Agnes Jacobes which was dated 1244, in the "Cartularium Monasterii de Rameseia", during the reign of King Henry 111, known as "The Frenchman", 1216 - 1272. Surnames became necessary when governments introduced personal taxation. In England this was known as Poll Tax. Throughout the centuries, surnames in every country have continued to "develop" often leading to astonishing variants of the original spelling.